But Padraig Harrington can end his 19-month victory drought after a second successive three under 69 left him lurking just three strokes behind leader Bryce Molder, who carded a superb 66 to lead by a stroke from Australia’s Cameron Percy (69) and American Alex Prugh (66) on nine under par. Lacking confidence since he injured his back in January, McIlroy carded a lacklustre 73 to finish two strokes outside the projected cut mark on three over par and he looked a forlorn figure as he was left facing his first weekend off since last May’s Players Championship at Sawgrass. Missing a cut is one thing but McIlroy confessed afterwards that apart from a recent three-day visit to Augusta National, he has not enjoyed himself on the golf course since the start of the year. Normally an exuberant character, he had little to smile about as he trudged away from the 18th yesterday having holed just one significant putt in two days and missed two tiddlers inside three and a half feet. “I’m hitting it a lot better but still not getting it around the golf course,” said McIlroy, who followed a bogey at the first with birdies at the sixth and eighth before covering the back nine in two over with a brace of bogey sixes on the par five 13th and 15th holes. “I don’t really know what to say. Just one over par for the tournament with nine holes to play, McIlroy had a fighting chance of making the cut but his inadequate short game and his ice cold putter put paid to any hopes he might have had of surviving. At the par-five 13th he tugged a fairway wood into a hazard and after chipping backwards to the fairway, he clumsily pitched 15 feet past the hole from around 30 yards short of the green and missed the putt. Ironically, the longest putt he holed all week was a slippery 14 footer for par at the par-three 14th, where he recovered from an almost impossible lie in a greenside trap. But his week effectively ended the moment he bogeyed the par-five 15th. Bunkered in two, he came up 40 yards short of the green with his third but after a brilliant flop shot to three feet, he lipped out for par and missed long range birdie chances on the last three greens. The Holywood starlet tried hard to look on the bright side but confessed that he hasn’t felt happy on a golf course since he visited Augusta a few weeks ago. England’s Lee Westwood shot a second round 68 to share fourth place with home hopes Joe Ogilvie, Anthony Kim and Kevin Stadler on seven under par. Harrington, meanwhile, picked up three birdies in his first four holes to get to six under par. He slipped back with a double bogey six at the 18th, his ninth, where he pulled his 180-yard approach from a fairway bunker into the lake that hugs the left hand side of the green. Unlike McIlroy, he dug deep on his back nine, picking up a birdie at the second before getting up and down from 75 yards for a brilliant par five at the fourth, where he was forced to take a penalty drop after driving into a hazard. His short game skills came to the rescue again at the sixth, where he overshot the green, shaved the hole with his pitch and drained a 14 footer for his par, and at the par-five eighth, where he got up and down for birdie thanks to a stunning 25 yard bunker shot to four feet. A laser like iron shot to the 204-yard ninth gave him a 20 foot birdie chance but his putt caught the left edge of the hole and spun out. 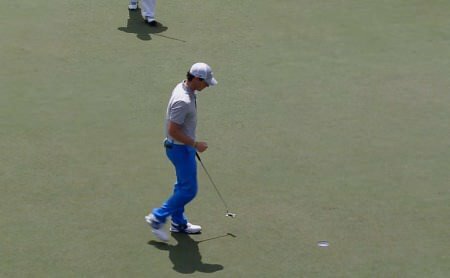 Rory McIlroy roared into contention for the Shell Houston Open as Padraig Harrington was driven to distraction by an errant driver. Padraig Harrington might only be one place ahead of Rory McIlroy in the world rankings but the gulf in experience that separates the three time major winner and the young Ulsterman was evident as they prepared for next week’s Masters Tournament at the Shell Houston Open. Pádraig Harrington's tenuous hopes of qualifying for the Masters on merit ended on a sad note when he suffered finger cramps late in his second round in the Shell Houston Open and shot a 79 to miss the cut by five shots.